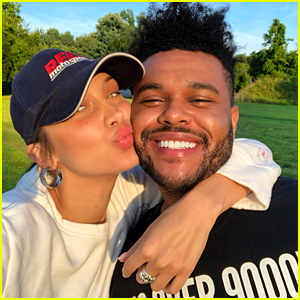 The Weeknd & Bella Hadid Look Cute Together Hand In Hand in NYC! | Bella Hadid, The Weeknd | Just Jared Jr. The Weeknd and Bella Hadid make such a cute couple. The 28-year-old Starboy singer and the 21-year-old model were seen stepping out holding hands from Four Seasons Residences on Wednesday (October 3) in New York City. The couple looked happy together as they strolled out into the city. Bella looked cool and casual in a black graphic tee, blue jeans and sneakers. The two were seen coupled up for a date night in the city a few days before (September 29), once again holding hands while enjoying a night out on the town.